Finally, a light duty diesel pickup with a fine-tuned and balanced approach to power, comfort, utility and conscientious fuel use. Dodge Ram 1500 series trucks is now offering the new 2014 Ram Eco Diesel light duty for a great Dodge experience and the assurance of owning the most environmentally friendly pickup on the market. The scientific genius at work in the Dodge facility has innovated a successful cross between using less fossil fuel, burning fewer carbons, yet still experiencing the ultimate in power with the legendary TorgueFlite V8 transmission that helped Dodge gain it reputation as the truck power leader. The Dodge Ram 1500 Eco Diesel is available for early consumer survey and purchase through any licensed Dodge dealer. This amazing vehicle retains the towing capacity and bed volume of previous favorite Dodge Rams, but it exhibits a thrust toward the future of the truck industry under the hood. The Eco Diesel V6 and V8 has successfully met the newest and strictest standards for vehicle emissions and doesn’t sacrifice an inch when it comes to power and torque. 240 horses is now proven to be efficient with the Eco Diesel Dodge Ram series. Whether its the Outdoorsman, Big Horn, Laramie or SLT design, Dodge is paving the way to a consumer love of powerful trucks that look great, perform well and protect the environment even with 420 pounds per foot torque. The new Eco Diesel Dodge also has the lowest C0-2 emissions of any truck on the road. Dodge 2014 Eco Diesel models have the most advanced, best-in-class engines on the market with full bio diesel conversion capability and options that never sacrifice power for eco-performance. Dodge is leading the world market in large and hefty rigs which comply with the newest environmental standards. The great thing is, their trucks offer power, performance and ultimate utility while meeting the expectations of the modern consumer world. 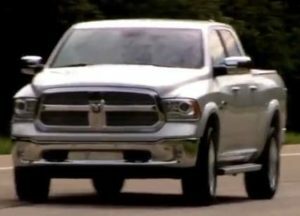 The 2014 Eco Diesel Ram 1500 is the light duty pickup offering crossover features for the next century, and it is a truck suitable for an environmentally-conscious consumer population that is addicted to both power and utility.